Due to the age and design of the building, mounting a permanently welded guardrail to the underlying roof structure would have been extremely difficult, costly, and time-consuming. It would require putting holes in the roof membrane just to find out where the guardrail could be attached, and then more openings would be required to actually attach guardrail to the structure. In this case, a non-penetrating guardrail like KeeGuard was ideal because it eliminated the need to cut or drill holes into the roof and was able to be installed in a short amount of time. Having a rooftop guardrail system that didn't stick out like a sore thumb amongst the rooftops was another concern that Flag Waterproofing had. Many guardrail systems only come in "Safety Yellow" and rely on powder coating as their only form of protection against corrosion. However, KeeGuard is entirely galvanized and can be easily powder coated on top of its galvanization so that it retains it's rust-resistant coating and can blend in seamlessly with the rest of the rooftop and surrounding skyline. The KeeGuard base fitting also allowed the railing to be tiled back away from the edge of the roof to further reduce visibility from ground-level and virtually eliminate it from the sight of pedestrians. 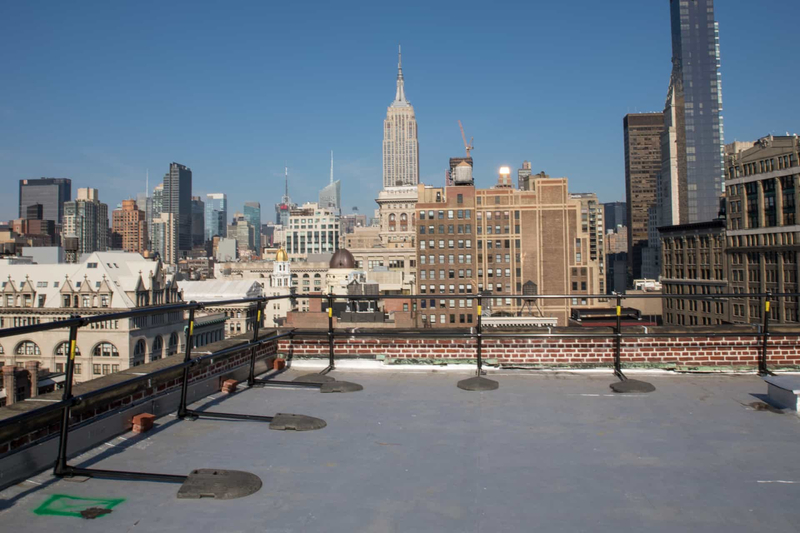 After finalizing the design and layout for multiple rooftops with Julian Adams, a Fall Protection Specialist at Simplified Safety, Flag Waterproofing was on-site and ready to install the system. 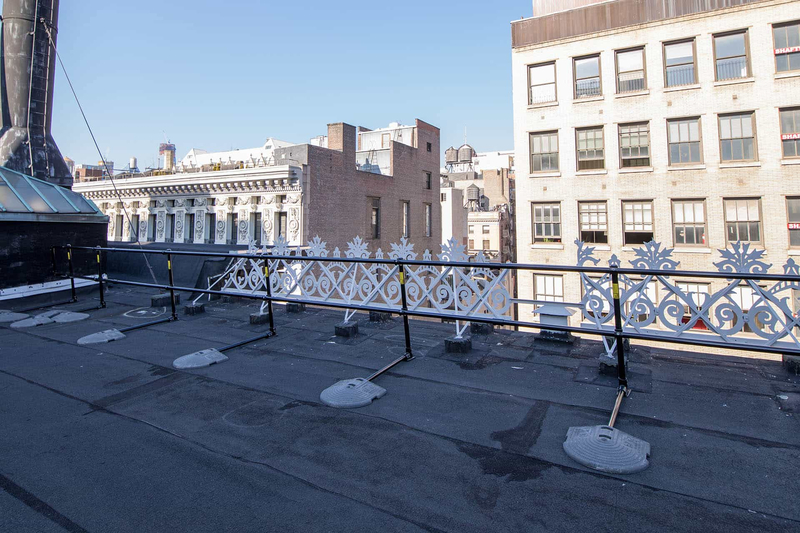 After installing a section of the railing they also noticed that there was more variance in the slope of the rooftop than was originally specified, but were able to easily work around this thanks to KeeGuard's simple design and modular components by placing spacers between the base fittings and the surface of the rooftop to make up the difference. In the end, they were able to install each section of the KeeGuard system in a matter of hours. After the installation was finalized a Fall Protection Specialist from the Simplified Safety team traveled to the site to certify the installation. This gives the building owner and Flag Waterproofing & Restoration the confidence and peace of mind knowing that the installation was done correctly and to the manufacturer's specifications. Thomas Delio from Flag Waterproofing & Restoration was on-site during the certification and had this to say about the project. KeeGuard was simple, straightforward, and easy to install. I look forward to installing more systems in the future. If you are looking to install non-penetrating guardrail on your rooftop, please contact our team of Fall Protection Specialists. They are here to help you ensure your rooftop is compliant, secure, and safe for your workers and your company.